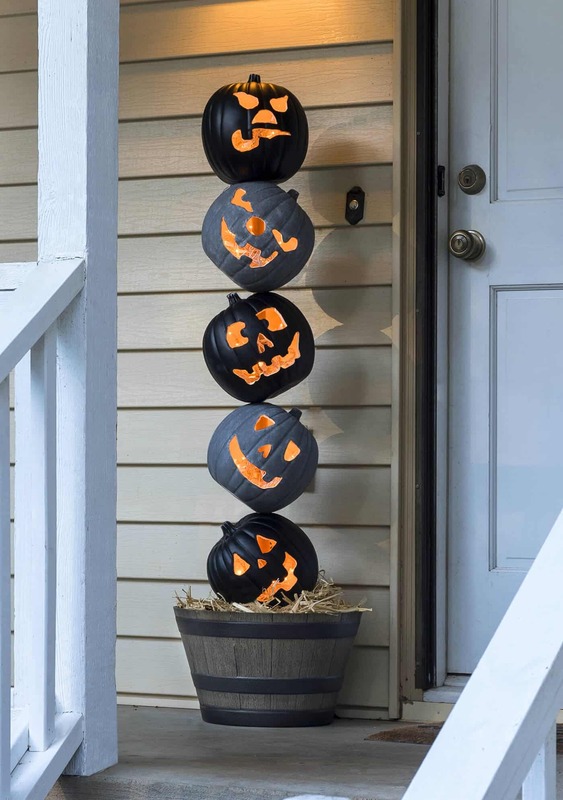 Grab some faux pumpkins from the craft store and create this unique Halloween pumpkin topiary! 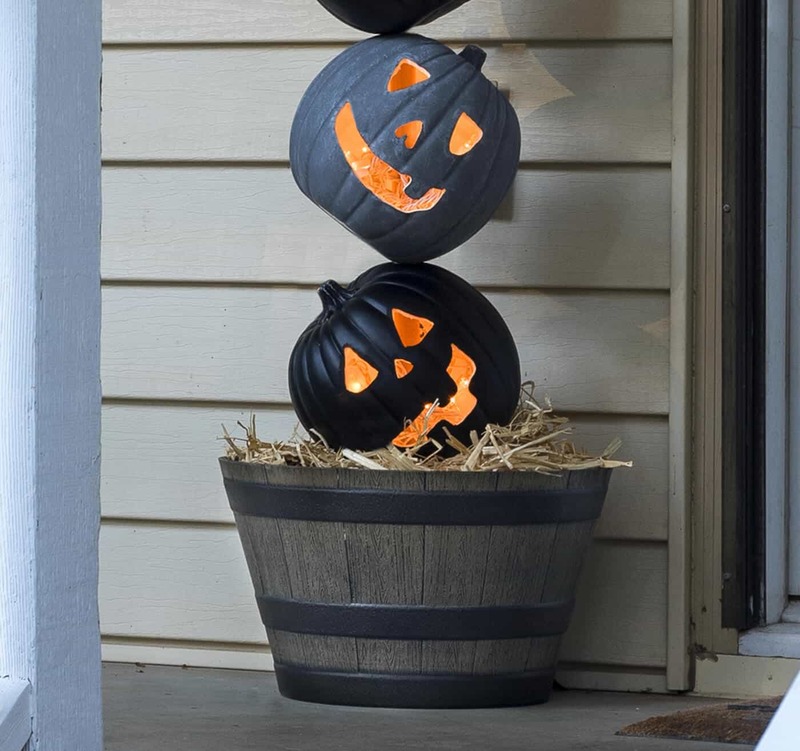 It will look perfect on your front porch. So festive! Sometimes you get a brilliant holiday DIY project idea – in this case it was Steve. I made the mistake (?) of dragging him a long to Michaels to grab some supplies, and I needed some craft pumpkins. He spotted the black and concrete ones in the bin and declared “I’m going to make a pumpkin topiary!” So what’s a girl to do but support her man in his Halloween endeavors? And that’s exactly what I did. We worked together to design this fun pumpkin topiary that could be put outside on a front porch for the holiday. There are some steps to it, but it’s not hard. 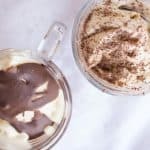 Learn how to make it below. Dremel 4000 tool – with the tile cutting bit and sanding drum. You could also use this multi-purpose cutting bit instead of the tile cutting bit, but we had the tile cutting bit so we used it! These are the type of craft pumpkins we used. 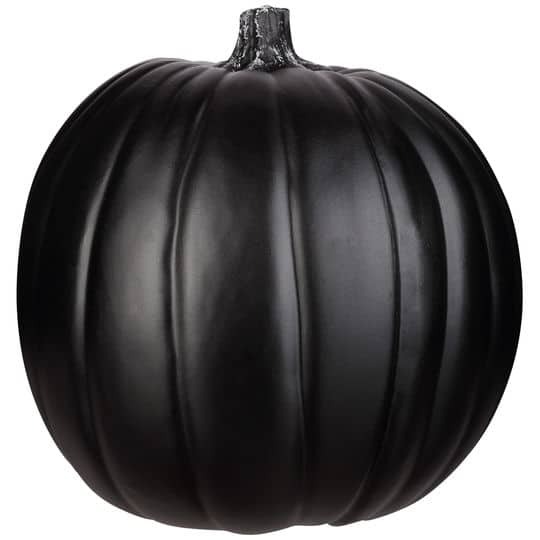 They were about 9″ each and we chose three black and two cement colored pumpkins. Use your coupon for the craft pumpkins or grab them on a sale that happens frequently during the holiday season! 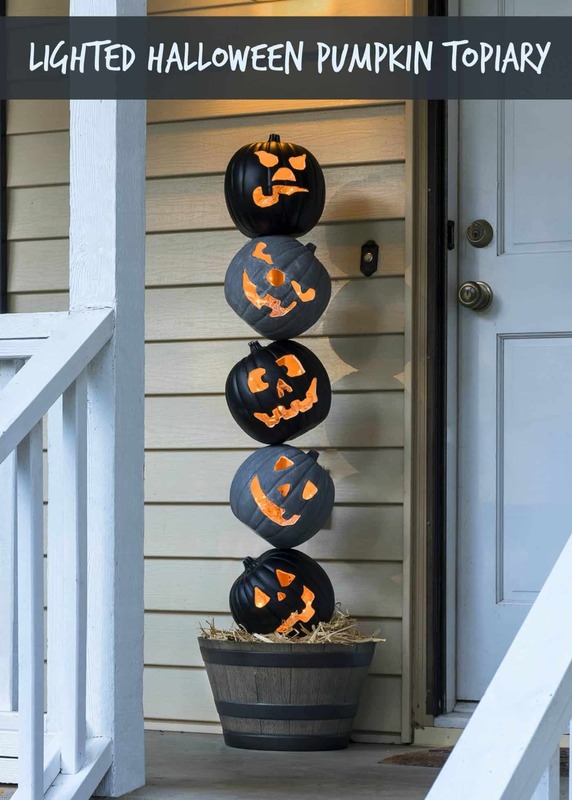 I’d never pay full price for craft pumpkins (insider tip!). 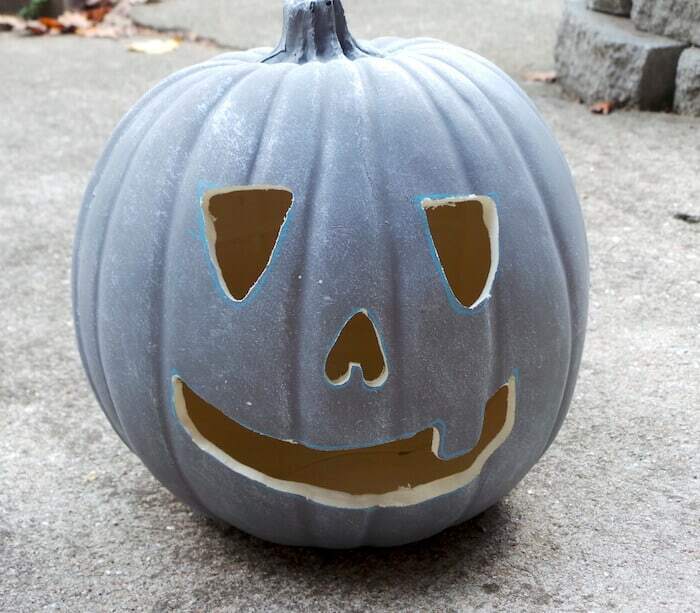 NOTE: I haven’t found craft pumpkins with the concrete finish since this post was done. 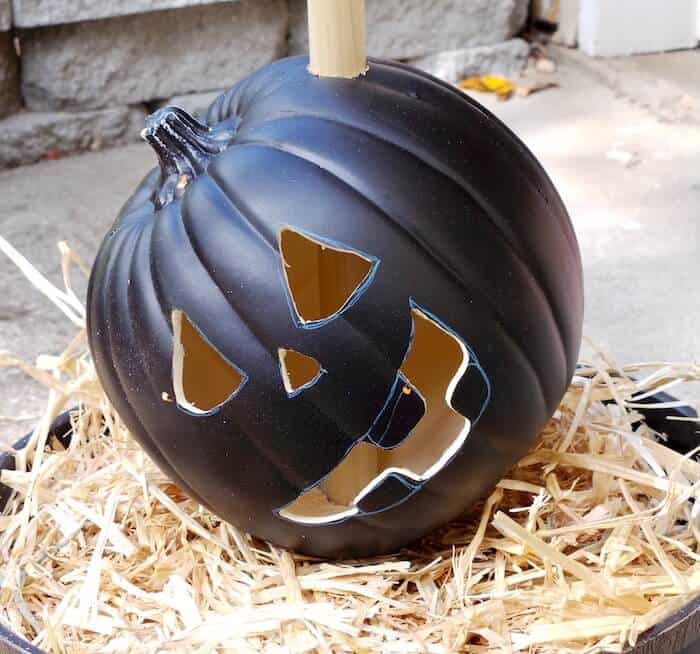 You can use any color faux pumpkins, or you can paint (with acrylic or spray paint) to be any color you like. You have a lot of options. Once you’ve picked your pumpkins, choose your faces. We just picked five different templates for carving online; they are very easy to find by Googling. We used them as inspiration to draw our faces on with a blue pencil. You can cut out the templates and trace them if you like, or hand draw like we did. It’s time to fire up the Dremel! Cut into your pumpkins and cut out the faces. This is the most time consuming part of the process. Keep in mind it doesn’t have to be exact . . . you can see we didn’t quite cut on the lines. It’s going to look fine when it’s done. 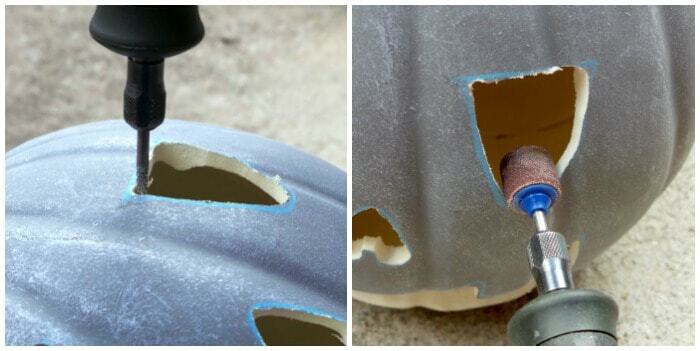 Use the sanding drum attachment to sand out the inside of the teeth, nose, and eyes. The cutting will have left ragged edges, and the sander smooths them out. Here’s one of our finished pumpkin friends! Repeat with all five pumpkins and set aside. 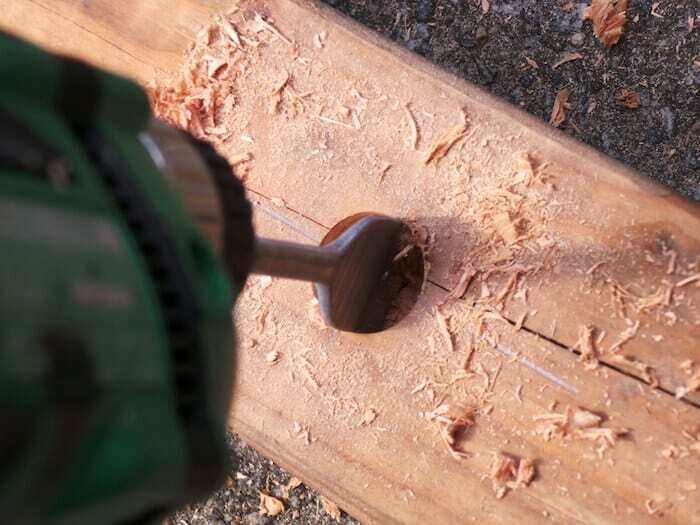 Use a drill with a 1″ spade bit to place two holes – one in each scrap on top of each other – into the wood. This is so you can layer them and stick the dowel rod through. If the wood splits a bit while you are drilling, it’s fine. You’re going to stabilize the base . . .
with dirt! We packed potting soil into our planter tightly. Normally with plants you don’t pack as tightly, but we need the base stabilized, and nothing is obviously going to be watered. 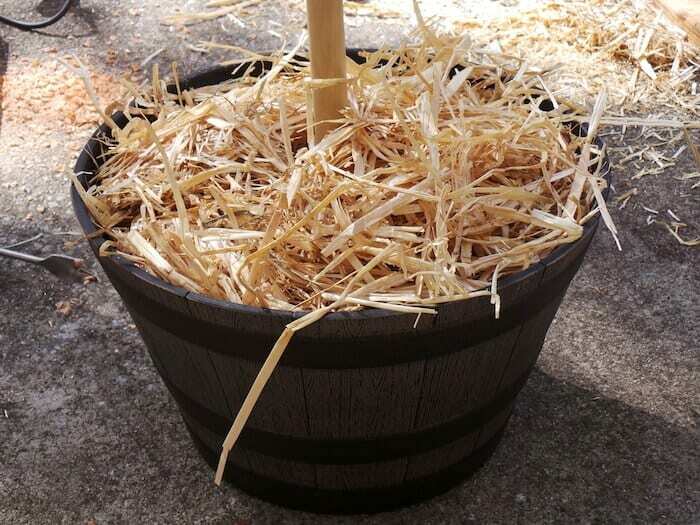 Spread hay into the planter around the base for a fun fall look. 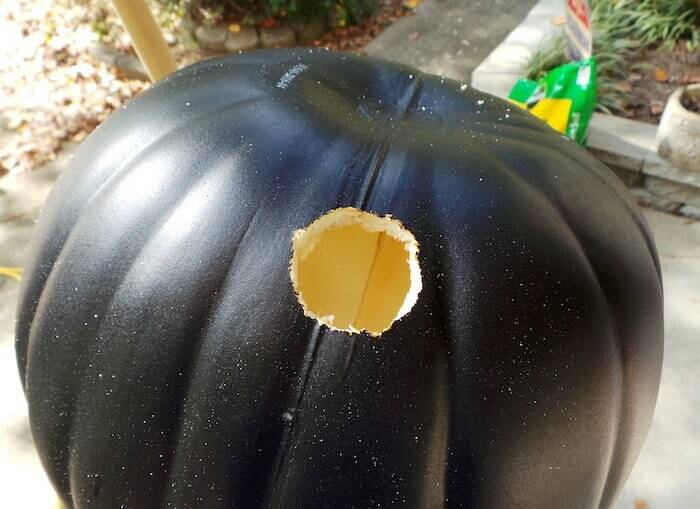 Now use your 1″ spade bit to drill the pumpkins! You’ll place three holes in each. Tilt them at angles and make a hole at the top and bottom for the dowel . . . then cut a hole in the back to insert the lights. See how it’s tilted and there’s a hole at the top and bottom? Slide it down the dowel rod – it should fit exactly. Tilt the next pumpkin the other way and repeat! You’ll see we didn’t erase the lines of the pencil yet. We forgot! We finally did it at this point. You might see that some of the pumpkin color rubs away in which case . . . touch up with acrylic paint and let dry. 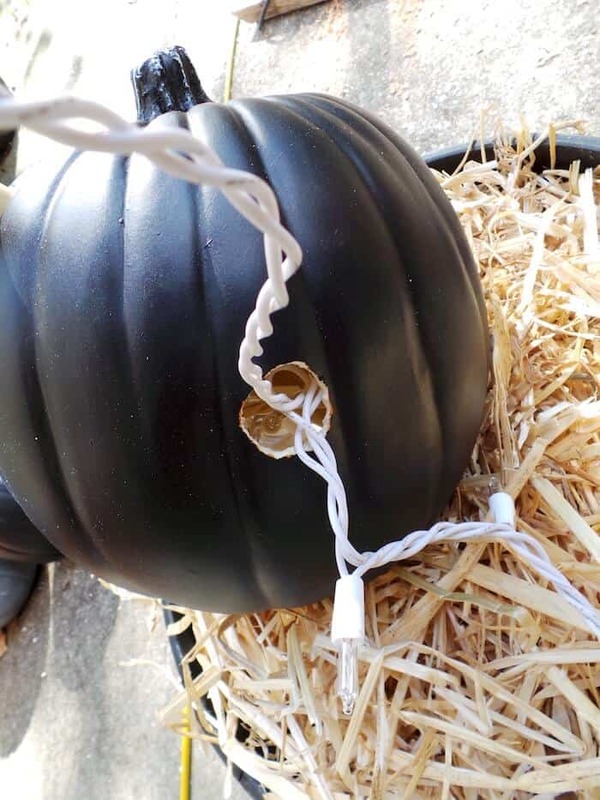 Place one light strand in the back of each pumpkin, leaving both ends hanging out. You’re going to attach the lights together this way. Cut a circular piece of black Duck Tape with a slit in it. Place over the hole with the parts of the light strand hanging out that you want to attach. Plug them all in! 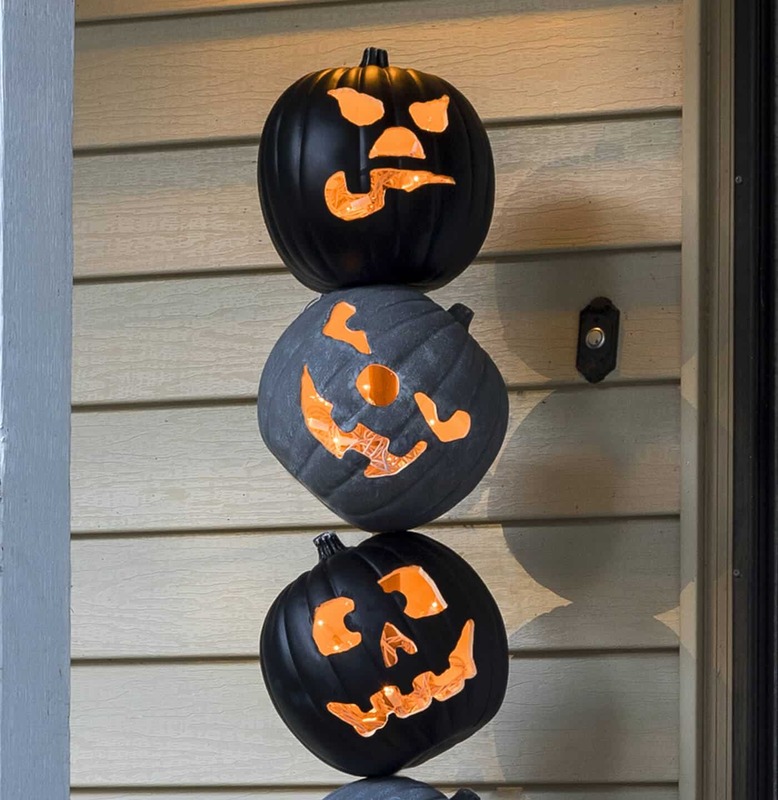 The bottom pumpkin will obviously go into a light plug. Place this topiary by an outlet or use an extension cord. Isn’t this fun?! While these lights are fine for outdoor use and the project is pretty solid, it should stay under a covered porch. Also be safe and don’t leave it plugged in all night or unattended for too long. Isn’t it fun? We are so happy with our finished pumpkin topiary! 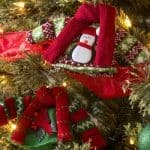 This is a holiday DIY project you’ll use year after year. Let us know your thoughts on our pumpkin topiary on in the comments; we’d love to hear! That’s so cute! Definitely bookmarking to make for next year!